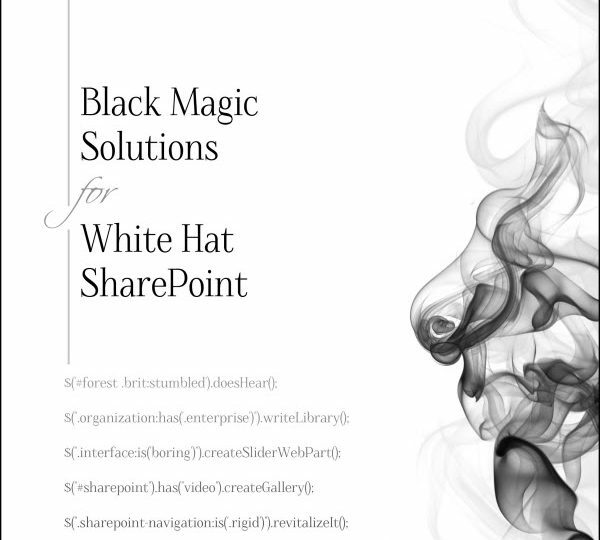 I contributed a chapter to the book Black Magic Solutions for White Hat SharePoint which is now available on Amazon. The book was organized by Mark Miller and includes chapters from several SharePoint community members. Mark’s goal was to break away from the traditional publishing model and self-publish an ebook in just a few months. You can read more about this project by previewing the book on Amazon or reading Mark’s article on NothingButSharePoint.com. My chapter demonstrates how to use jQuery Mobile to create a mobile-friendly blog using an out-of-the-box SharePoint blog site. It’s based on a solution I built nearly three years ago using SharePoint 2007 as an extranet. The original solution involved a blog, some custom forms, and several content pages all rendered by jQuery Mobile, with content loaded via AJAX (using SPServices). The solution in the chapter is focused only on the blog, but I added a few enhancements using new features of jQuery Mobile 1.3 that weren’t around three years ago. Marc D. Anderson (keeping track of the different Mar(k/c)s on this project can be tricky!) approached me about contributing to the book after he was contacted by Mark Miller. Although I’ve written an article on NothingButSharePoint.com and had some interactions with other members of the SharePoint community, I haven’t been very active lately. Fortunately Marc and I have kept in touch and he thought of me as someone who could contribute to the book. If not for that relationship, I would not have known about the book at all. Thanks Marc! The SharePoint community is full of people building creative solutions that go beyond the solutions Microsoft provides. SharePoint is truly a platform, and the community is always innovating and moving past the limitations that SharePoint seems to impose. I’ve grown more as a SharePoint developer by reading blog posts and books like this than I ever have reading documentation or IT-oriented books. This book reads like a collection of long-form blog posts, and that’s a great thing! This is the one aspect of the project that I was not thrilled about. Initially I was excited about seeing how well Yammer could work to help organize the project, especially since it looks like Yammer will be rolled into future versions of SharePoint. Now that the project is over I can say that Yammer is not enough on its own for this kind of project. First, let me say that I’ve used Yammer in an enterprise setting as a corporate social network, and I was very impressed with it. Yammer works great for informal conversations. You can ask a question and receive several answers right away from your colleagues across the organization. You can set up a simple poll and see the results in your feed. You can do lots of cool social stuff like create groups, comment on photos, and more enterprisey things like upload and share documents. Unfortunately when it comes to tracking tasks and keeping a project organized, Yammer quickly devolves into a game of scrolling through your feed to find the right conversation, then reading through the conversation thread to find the pertinent details. A simple message asking for headshots can get buried by a recent reply to a conversation that was posted weeks ago. I get what Yammer is trying to accomplish, and it works well for informal conversations, but I don’t think it’s the right tool for what we were trying to do. I’m glad Mark used this as an opportunity to see how Yammer can be leveraged for a project like this. Ultimately it got the job done and we ended up with a pretty great book. However, I do think that this project would have been better-served by a typical Team or Project site in SharePoint. We could create a wiki with general reference information (such as how to set up an Amazon author profile or resolution/DPI requirements for our headshots). A task list would allow us to assign tasks with due dates (such as submit first draft, submit a bio, etc.). Any missed due dates would have generated an email to the assignee (and I did miss a due date or two). A document library with versions would have allowed us to create our chapters from the approved Word template file and track changes via Microsoft Word. Our reviewers would have been able to leave comments or make edits to the chapters right in the document without downloading and uploading multiple copies. A calendar could show project milestones and key communication dates (such as when the book will be announced in the EUSP newsletter or on NothingButSharePoint.com). A document or picture library could store our full-resolution screenshots, headshots, and any other images used (such as the book cover). If Microsoft can find the right blend of social features with task-oriented features, they could have a real winner on their hands as they integrate Yammer into SharePoint. Other products like Basecamp (which I use daily) have already done a good job with this, so I hope to see Microsoft follow suit. Overall this experience was a lot of fun! It was great to work with members of the SharePoint Community and get feedback from community members. It also feels pretty good to have my name listed as an author! Kudos to everyone involved in the project! Let me know if you read the book, and be sure to leave a review on Amazon!